It has become tradition for us to take a Knee High by the 4th of July photo every year. 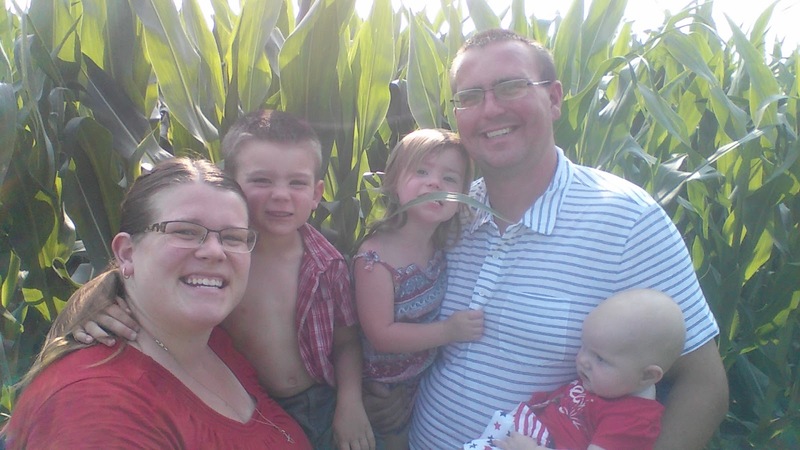 It is a fun way to document our farm family, as well as our crop progress for the year. Check out past years - 2014, 2013, 2012. Knee high by the 4th of July is an old farmer saying and benchmark for a good corn crop. But with improved seed genetics and farming practices, farmers expect their corn to be at least waist high if not head high, like we are seeing this year on our farm in North Iowa. 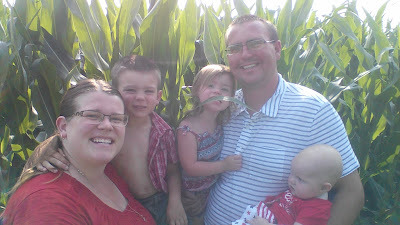 We had to pull out the selfie stick too and take a photo in the corn! I'm amazed at how fast the corn grows. It seems like just a few weeks ago everyone was planting. Nice family pic! :) I'm also kind of cracking up at K's open shirt. I just love your kids! The corn is looking so good right now!!! I noticed the open shirt as well and comment to Chris on it. :-) I love the new blog look as well. Very nice and clean looking and easy to navigate. Good job! Not only has your corn grown but your family! I haven't stopped by in awhile. I hope sweet corn is doing as well and I get a treat on my visit back soon! Sweet corn is also doing well. It is starting to be available more and more as weeks go along. I'm sure you'll find some on your visit back. We haven't had any yet but we hope to have some of our own ready next week. My grandfather always said "As high as an elephant's eye by the Fourth of July!" Some years that elephant may have been kneeling. As high as an elephant's eye! Wow! That's tall. What I should have also done is take a photo of us in one of our soybean fields. They're probably knee high. I also love the new look of the blog! And, that corn is crazy! And LP is such a little stud with his unbuttoned shirt! Your kids rock!